The U.S. Air Force took charge Wednesday of a $2 billion antimatter detector destined to catch the last scheduled space shuttle flight in February 2011. 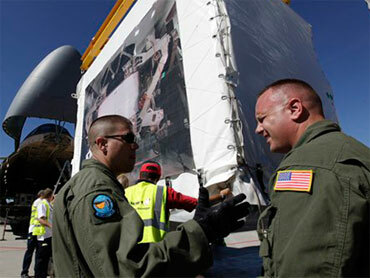 Airmen loaded the giant Alpha Magnetic Spectrometer into a C-5M Super Galaxy plane at Geneva airport for takeoff to Kennedy Space Center in Florida on Thursday. The military planes are normally used to fly tanks and helicopters around the world, but scientists at the European Center for Nuclear Research, or CERN, had to ask the U.S. Air Force to help them out when they found the 8.3-ton (7.5 metric ton) device wouldn't fit into a 747 jumbo jet. Sam Ting, a Nobel laureate and professor of physics at the Massachusetts Institute of Technology, said the Alpha Magnetic Spectrometer would be docked to the International Space Station to collect evidence of antimatter, dark matter and other phenomena over the next 20 years. The AMS detector will complement CERN's Large Hadron Collider, a massive atom smasher deep beneath the Swiss-French border that scientists are using to simulate conditions similar to those just after the Big Bang in the hope of better understanding the makeup of the universe. Antimatter, which the device was primarily designed to find, is sometimes referred to as the evil twin of ordinary matter and scientists believe the Big Bang created both in equal amounts - meaning that, in theory, there should be an identical universe to ours out there made entirely of antimatter. But so far scientists have been unable to detect antimatter except in the lab. By searching outside the protective shell of Earth's atmosphere they hope to find solid proof of the elusive particle's existence - or reasons for its absence. The Alpha Magnetic Spectrometer, which took about 15 years to build and was part-funded by the U.S. Department of Energy, will be one of two payloads carried to the space station on Endeavour STS-134, NASA's last shuttle mission scheduled for Feb. 26, 2011. Separately, CERN staff protested Wednesday against proposed cuts to their next five-year budget, saying this could "dangerously compromise the running of the organization" they say helped develop scientific breakthroughs such as medical scanners, computer grids and the World Wide Web. Member states have pressed CERN to sharply reduce its 5 billion Swiss francs ($4.87 billion) budget for the period from 2011 to 2015. The organization recently offered to cut back its funding demands by about 480 million Swiss francs ($467 million) - a move that will require the $10 billion Large Hadron Collider to be switched off for all of 2012. The AMS detector was funded separately and wouldn't be affected by any cuts that might be agreed when the organization's finance committee meets Sept. 16, said CERN spokesman James Gillies.